Seems to have a rather long respawn timer for a quest mob, 5-7 minutes or so. He spawns in the biggest room in the cave beneath Skulk Rock. Kinda hard to miss him once he's spawned.. I'm surprised no one has mention this mob's quite dangerous ability: Consumed. After a little bit in melee range(at least I don't think he can cast it ranged? ), he will pull you inside of himself and deal 5% of your health every other second. This lasts untill you have killed him. You can still attack normally inside of his body, and you're still able to be targetted by wandering slimes, so make sure you've got plenty of health before engaging, if you aren't wearing full heirlooms. Don't know if its just me but this is almost impossible to solo on a Rogue (no heirlooms). Energy regen is way too slow and getting hit for 5% health is a huge amount, it all adds up and I keep dying before bringing him below 10% health. So, after several failed attempts and more than a few uttered curses I managed to kill this guy. I'm not even sure if this trick will work again, (I sure wasn't going to wait for him to respawn to try it again), but I figured I would post it so someone else can give it a try. This will only work for hunters with a pet! Here's a screenshot I took from after I killed him (I didn't think to take screenshots before or during the kill, and as I said, I have no desire to go through killing him a second time. Kill all the Jade Oozes and Green Sludges in the area. Left click him to select him, and cast Hunter's Mark on him. Shoot Concussive Shot at Direglob and he should start up the stone ramp towards you on your left. Your pet should go right after him and start attacking him. With any luck, the same thing that happened to me will happen to you, and Direglob will turn his attention to your pet rather than you. Now, just keep shooting at him and keeping track of your pets health. And stay on that rock! When I did it, if my pets health went below 25% I cast Mend Pet to keep him from getting killed. It took less than a minute to kill Direglob like this, but I died four or five times prior by running into the fight headlong, so at least give this a try, provided you're a hunter that is. If you're not a hunter, I would still recommend standing on the rock and attacking him from there. It will buy you a little bit of time since he'll have to climb the ramp before he can attack you back. I was finally able to take him down as a 33 Frost Mage no heilooms. I had been trying to kill him for a good 30 minutes or so with no luck. On probably the 10th try I decided since I was going to die anyways so I might as well delay the inevitable, so I used Ice Block while consumed. As luck would have it I either outlasted the debuff or ice block clears it. Anyways just my hopefully helpful 2 cents. Multiple deaths later on my level 32 rogue, no luck. Cannot for the life of me take him down. The Consume works far too quickly, even after popping a health pot and using Recuperation, and energy does not regen fast enough to straight dps him down. Will simply return and try this quest later after gaining a level or two. My gf took this down on her Shaman. Soloed this on my 33 rogue, no heirlooms. Use a health potion when about to die. Stack combo points for big damage. killed it on second try with 32 rogue no herilooms , just clear 1 way of the room and make 5 combo pointed recuparate on the other side of room , sprint , stealthi open with cheap , use evaison, do the dps its not that hard. Easily soloed on my level 33 rogue. no real tactics needed, just aggro'd it with full health and spammed lighning bolt, kept flame shock active and lava burst whenever up. Didnt get below 50% health. No kiting or anything was needed, no pots and no heals. there should be more enemies like this! good god, he has TUSKS. Soloed 33 Fire Mage. Go all the way to the top. Hope and Pray. Has a very long respawn time (~8 mins). If there is another friendly player around, best group up with them. Has a long respawn time (~5 mins). Soloed as a level 33 subtlety rogue after a couple of failed attempts, using premeditation followed by ambush, then evasion and eviscerate and spamming hemorrhage with eviscerate thrown in every four or five hemorrhages. However, I do advise clearing the other mobs first -- I didn't, and was killed by a couple of them moments after I took down Direglob. Not tragic, but I could have done better. Soloed it, 34 hunter.... Thank god for pets Lol! You guys know what a Direglob is right? It's like a glob, but it's dire. If he has just been killed you can server jump into a raid group until you find it, when you do, just auto attack and leave the raid, by doing this you will get the quest item, since you are not in a raid and, you won't get phased back to your server when you are in combat. 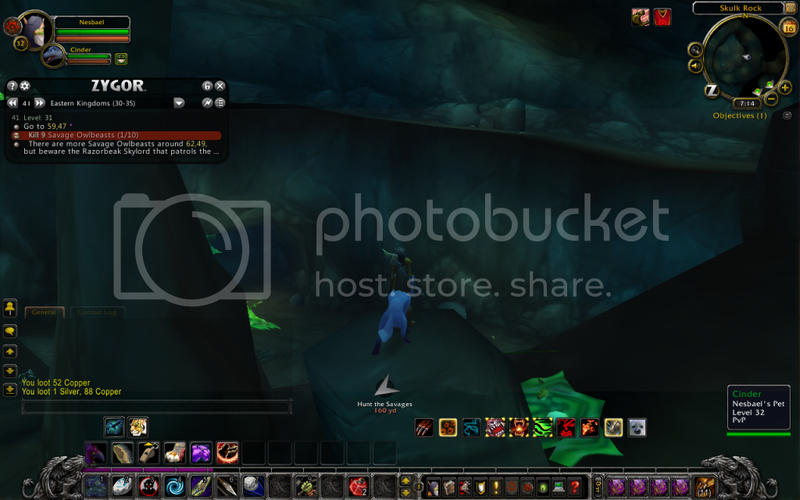 On the day of the cataclysm release I came into this cave to kill him only to notice he'd been tagged by someone of the opposite faction. Seven years later and I'm still waiting on that respawn. After the new leveling changes, the 5% ticking damage may cause some classes or specs to find this near impossible unless they have a healing talent/skill. As a prot or Arms warrior at level 30-35ish, I found it impossible (Although I could have walked to a resting spot and tried with the victory rush talent), but re-speccing to Fury made the fight immediately successful. For ranged DPS, pull it from the top of the cave. Just stand at the edge of the lip so it's in LOS, and fire away. It has to climb all the way up the spiral to get to you, and you can hit it the whole way. Este PNJ se puede encontrar en Tierras del Interior (4).